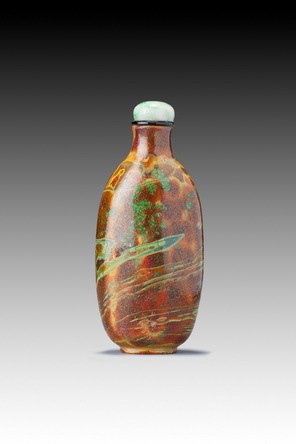 Some realgar-glass is streaked with green, a colour added to the mixture and possibly derived from copper. However, having examined a number of these, including two excavated from tombs in Beijing, we have reached the conclusion that the green typified here is a product of decomposition of the surface in damp conditions (regardless of the extent to which there may have been green colouring in the original glass mix). This bottle may also have been buried at some time. Under high magnification, the green areas are revealed as crystalline, as if the dampness of the earth has altered the physical composition of the glass—which is not otherwise a crystalline substance. Moreover, the crizzling is confined to the exterior surface. This suggests that it is due to extensive exposure to dampness, since on snuff bottles natural crizzling is generally more apparent on the interior surface. On one of the recently excavated examples, the bronze collar of the stopper was so corroded that it had become sealed to the lip of the bottle, providing an effective barrier against interior dampness while allowing the exterior to decompose to the point at which one could prize flakes from it with a finger nail. The interior surface had not decomposed at all. Although of a less-standard form, the vertical lines of paler colour up the narrow sides prove that this was blown into a mould. 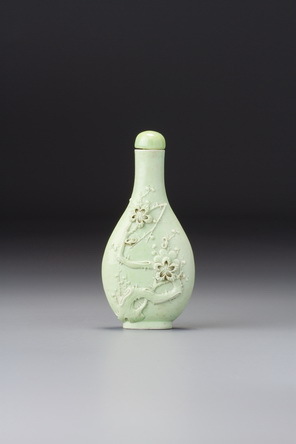 A yellow glass bottle similarly severely degraded at the surface, with a Qianlong reign mark, is to be found in the Rietberg Museum (Hall 1993, no. 23).